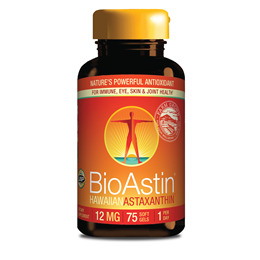 BioAstin Astaxanthin is a natural health supplement with powerful antioxidant benefits. Astaxanthin has shown to be far more powerful than other antioxidants such as Vitamin E and beta-carotene. Astaxanthin`s ability to scavenge free radicals has led many to believe it may help support the body in protecting itself from the harmful effects of UV radiation and allow users to stay out in the sun longer than is advised using normal SPF creams. Nutrex Hawaii produces BioAstin from microalgae and it was the first source of astaxanthin for human nutrition that has been reviewed by the U.S. Food and Drug Administration (FDA). Natural Astaxanthin (from Haematoccocus pluvialis microalgae), high oleic safflower oil, gelatin (bovine), glycerin, purified water, natural tocopherols. BioAstin is also free of yeast, corn, wheat, gluten, lactose, and GMOs. Take 1 gel cap daily with meals. BioAstin is best absorbed when taken with food or meal that contains high fat. Results seen within 2-6 weeks of daily use. 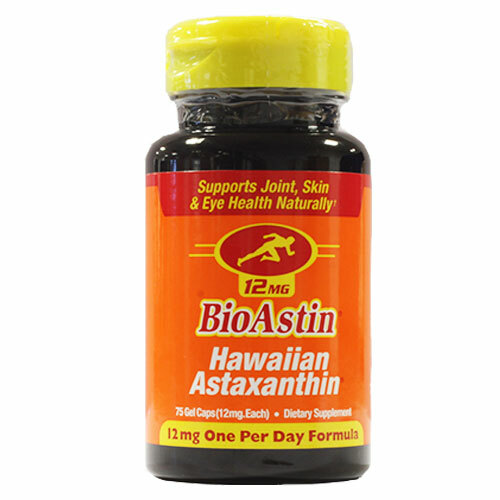 Below are reviews of Nutrex BioAstin Hawaiian Astaxanthin One-a-Day - 75 x 12mg Gel Caps by bodykind customers. If you have tried this product we'd love to hear what you think so please leave a review. Excellent product. Last order was delayed, but they sent first class a second one, which I received the day after my call. Good reliable company. Will use again. Very effective for pain relief. I have an accident which might be some nerve damage during weight lifting and the pain never went away. I tried various balms and painkillers but these tabs make the pain go away so I can sleep normally and do all activities as usual. I can tell they are working as the pain comes back when I stop them. I am giving this 5 stars because it has helped with floaters in my eyes but also helped with tinnitus. It is higher strength than normal but I believe is more effective. Excellent product and excellent service from bodykind. Haven’t seen much difference using this product but it has only been 3 weeks maybe make a difference when taken longer it is a good antioxidant though it needs to be taken with fat which I don’t always have every day....no difference to my eyes yet either. I intend to take this longer but I do believe it has helped with eye floaters so far. I use this product to reduce sunburn and it seems to work well. I've been taking this product for 6 weeks now and I feel it has benefitted both my skin and my eyes. I'm very pleased with it, and I also appreciate the efficient service. Great antioxidant and really efficient service which is much appreciated, thank you. Great price, can't say for sure if I've noticed any remarkable change yet. However I still take one daily. Probably once I start sleeping better then I'll be able to notice some results. Happy with the product. Fantastic to find it on sale. Very good customer service. Sure I can feel the difference at the higher dose good product . Love this product! Great for macular health and is many times more potent than Vitamin C as an antioxidant. Best quality product, be careful of imitations. Amazing - really great product I have an autoimmune illness and severe joint problems and I've found this has made a fantastic difference to the joint pains I usually get. I've only been taking it for 1 month so I'm looking forward to the continued benefits with longer use. Good product wouldn't mind the book that Daniel received, when I order next. Fast delivery good price, I used to send for it from Hawaii, it took ages and with the postage cost a lot more. Brilliant product. It really matches up to all the claims made about it. From my own point of view, I suffered from " floaters" in my eyes for years now. Without noticing it, they have now disappeared. !!!! I believe Nutrex is the original brand that came out with this antioxidant; good product. I received a book about Astaxanthin with my previous order as well; interesting read! I will carry on using this on a daily basis. Good service from bodykind, thank you! Astaxanthin is a first rate antioxidant with multiple benefits. Brilliant customer service as always from bodykind. Very good source of antioxidants, best quality! Very pleased with this product and so is my optician (as my eye condition has not deteriorated). In addition, the product is always delivered safely and promptly. Thank you. I ordered BioAstin to see if it would help me to overcome sore eyes. It has certainly made a great difference, but I have also felt a huge difference in joint flexibility and skin health. Quite remarkable! This is a very hard working supplement. I noticed the benefits after just a week. I would recommend BioAstin to who is looking for a great supplement with multiple benefits. Have used it before, but not this particular brand. It's as good as , if not better than my previous batch. A fantastic product, I've been using it now for the last 18 months. I didn't burn over summer despite being out in the sun a lot and to Australia two weeks ago and not using sun protection lotion. It's done wonders for my immune system after being on high dose steroids for 6 months in 2014. I wouldn't go a day without it! Fantastic product! Very successful in helping to prevent sunburn - amongst loads of other things! A very potent amount of one of natures most powerful antioxidants. Great protection for the eyes and sold at a good price.